I'm an actor-writer-comedian based in New York City. My original series, Night Crew, won the Comedy Central Development Award at NYTVF 2017. And I just started post-production on my new sci-fi comedy series, Early To Rise. I started TOS Comedy, a video sketch comedy group with a monthly Public Access TV Show. We've created dozens of videos that have been featured by Mashable and Funny Or Die. My most recent solo show, ADRIEN: Album Drop Music Festival, went up at The PIT in November 2018. For the show, I wrote and produced 6 new comedic pop songs. As a huge musical theatre nerd, I wrote and performed in a musical sketch comedy show, Meet The CEOs: A Startup Musical, that was featured at Austin Sketch Fest in May 2017. You can catch me performing in a brand new sketch show every month with Kids These Days and BoogieManja. I also do Musical Improv with Elevator Talk every Wednesday at 8pm. All at The PIT! Check out my Calendar for details. And if this block of text wasn’t long enough for you, I also play piano and accompany a bunch of improvised musicals including Baby Wants Candy, Blank! The Musical, and Broadway’s Next Hit Musical. In January 2017, I started writing a new comedic series called Night Crew with my sketch group, GEIL. We produced 5 episodes in the spring, brought the series to NYTVF in the fall, and won the Comedy Central Development Award! We’re releasing it in 2019, but for now, check out the trailer below! A new sci-fi comedy series from GEIL. Three interstellar travelers are awoken from hibernation earlier than expected. They’re stuck in their hibernation pods. And very bored. We wrote the series over the summer of 2018, and wrapped production in December 2018. Currently in post-production! A solo show making fun of music festivals and pop music. I tattoo’d up my neck (temporarily) with a bunch of insane hashtags for the debut of my solo show at Solocom 2018 at The PIT. Then I took the stage and performed 6 original comedic songs that made fun of all genres of pop song. From my “Indie Pop Folk Rock Song”, to “The Song That Everybody Knows”, to an homage to EDM where I reveal my Social Security Number to the audience. Songs coming to Spotify in 2019! I started TOS Comedy in 2015 with a small group of comedians I knew from Texas, and a bunch of new folks we met and fell in love with through UCB in New York. Check out a few videos below, and even more on my Videos page! We started producing a monthly half-hour TV show full of new sketch comedy videos each month on BRIC and MNN in New York City. Some of these sketches were featured by Mashable and Funny Or Die. TOS Comedy has also produced several live sketch shows at The PIT, Chicago Sketch Fest, Hell Yes Fest, and at Brown University. 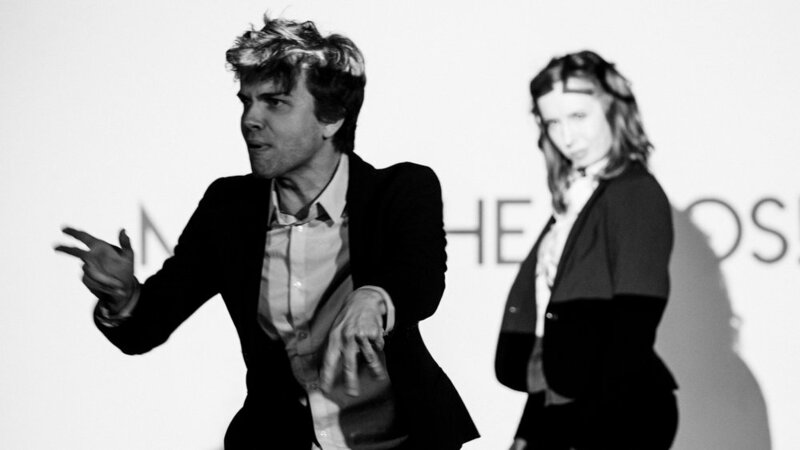 A Musical Sketch Comedy Show about Startups! We began writing the show in spring 2016, starting with a bunch of sketches based in around startups. After deciding to structure the show like a new-hire orientation presentation, I started writing and recording the backing tracks for songs to tie the show together. We first put the show up at The PIT in NYC for a 4-week run. After a near-complete re-write, we brought the show to Austin Sketch Fest in May 2017.